Here at Home Office Digital, we are continuously trying to improve how we function as a team. One of the ways we do this is through our Organisational Sprint (org-sprint for short), which provides a way of keeping track of work to improve the directorate, identifying where actions are blocked or stuck, and a way of solving these blockers . I’m Justin Hill – I work on Digital Strategy in HOD and, as part of my role, I act as delivery manager for org-sprints. What is the org sprint? The Organisational Sprint is a one month sprint cycle where all members of Home Office Digital (HOD) can carry out tasks to make our team more efficient, deliver more and a better place to be. It’s a way for us to collaborate and fix the problems we face as a team. We focus on a couple of themes in each sprint, known as ‘epics’. We split these into multiple user stories and tasks which are then displayed on our planning wall. To keep track of progress we hold bi-weekly stand-ups, which allow us to act where there are blockers/delays for whatever reason. Anyone in HOD can come to a standup and take on a user story or task. The idea is that, by the end of the sprint, all the user stories will all be completed and the ‘epic’ will be resolved. We have retrospectives (retros) at the end of each sprint to look at how things have gone and what could be improved. Have far fewer epics to focus our efforts. In previous sprints we’ve been spread thin over too many epics. By reducing the number we look at in each sprint, we can do these epics well, and reduce the risk of not delivering. Have a dedicated delivery manager for the process. This has helped with the running of the sprint, with the delivery manager leading stand-ups, retrospectives and planning sessions. The delivery manager aims to make the process more self-organising, removing blockers to delivery. Improve the prioritisation process of epics to make it more democratic and inclusive. Rather than have the epics prioritised by a group of people in a room, we’re trying to open up the process to include all of HOD. We’re trialling this using online apps where people can suggest and vote on themes they would like addressed as part of the sprint. Be better at sharing success stories: A lot of good stuff comes out of the org-sprint, but we aren’t that good at letting people know. 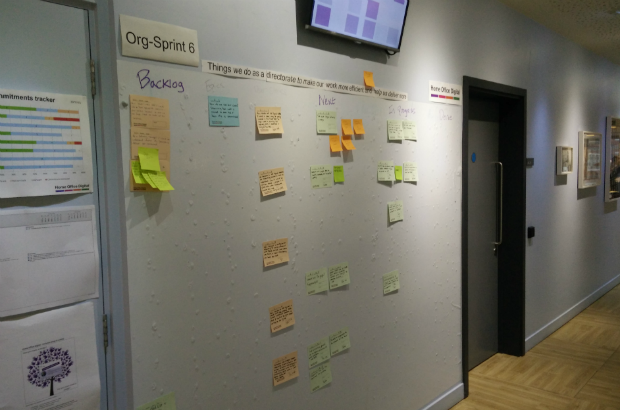 As a result we’re going to relaunch the sprint and look at ways of visibly displaying success stories, for example by showcasing examples next to the org-sprint wall . Encourage shared ownership: There’s a tendency for the same people to do a lot of the tasks. To improve this, we’re looking at ways of encouraging greater ownership through making prioritisation more inclusive (discussed above) and by trying to make it easier for anyone to take on actions. Focus on delivery: We've moved down from three month to one month sprints to increase the focus on getting stuff done by trying to keep momentum going. In the three month sprints we found that there were typically lulls half way through the sprint, so this is an attempt to keep things moving. We'll also be following up more with action owners were work isn't progressing to ensure there aren't any bottlenecks. the Home Team, to centralise expertise in strategy, on-boarding, communications, engagement and resources. This saves duplication of effort by giving people a central point of contact to get issues sorted. the Ideas Stream - a regular session for members of HOD to show off innovative ideas that could help colleagues do things better, and show and tells from other projects. We’ll be hearing from Ben who organises the Ideas Stream in a follow up post. If you’re in HOD, why not get involved with the Org-Sprint? Come along to one of our stand ups and take on some task. Drop me an email for more information. Do you have other ways of trying to improve the places you work? Let us know in the comments below or on twitter.